The Autoreflex A3 was introduced in 1973 as a successor to the Autoreflex A1000 and as a simpler and cheaper alternative to the Autoreflex T3. In the early and mid-70's, full-featured SLR cameras were still very expensive, valuable devices. On the other hand, compact cameras almost exclusively had fixed lenses with fixed focal lengths, that did not provide the versatility of today's compact cameras with zoom lenses. To close the gap, many manufacturers simply offered »stripped-down« versions of their SLR camera bodies as beginner's models and cheaper alternative. So did Konica. The simplest way to make the cameras cheaper was to leave out features that were not absolutely necessary, but costly. The Autoreflex A3 is nothing else than an Autoreflex T3, reduced to the necessary minimum. The Autoreflex A3 was available in chrome-black only, a black version like with the full-featured »big sister« Autoreflex T3 was not being offered. Also, the optional split-image mat screen available for the Autoreflex T3 was not available for the Autoreflex A3. As the Autoreflex A3 does not have an on / off switch, a lid should always be kept on the lens when the camera is not in use, otherwise the batteries will not last long. If this is alwas done, the battery consumption stays within acceptable limits. Like all its predecessors and successors from the »big« Autoreflex series, the Autoreflex A3 is extremely sturdily built and takes abuse well. The Copal vertical travelling metal focal plane shutter works reliably and exactly even in very cold temperatures and after a long time of use. All in all a real workhorse, that is still usable and suitable for everyday use after 30 years. The Autoreflex A3 is, like all the »big« Autoreflex cameras, quite big and rather heavy – especially when compared to modern cameras. The Copal metal focal plane shutter is very noisy, the sound can be disturbing occasionally. As a camera for normal use, I would not buy an Autoreflex A3 nowadays. The Autoreflex A3 is relatively rare and because of this, it is just as expensive or sometimes even more expensive than the much better equipped Autoreflex T3. Compared to this model, the Autoreflex A3 offers no advantages, so there is no reason not to get the better features of the Autoreflex T3. The Autoreflex A3 is only interesting as a collector's item nowadays – but if you already have one, you can of course continue to use it. Like many other cameras from this era, the Autoreflex A3 uses mercury oxyde batteries for the light meter (2x type PX675). These batteries are not manufactured any more for environmental reasons and become more and more difficult to get. The usage of silver oxyde or alkaline batteries of the same size (SR44 or LR44, respectively) causes wrong meter readings, because these batteries have different voltages. There are several possibilities to fix this problem. You can find more information on the subject of mercury oxyde batteries if you follow the link. The Autoreflex A3 was superseded by the completely new designed Autoreflex TC in 1976. 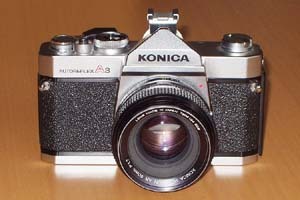 I do not know whether the Autoreflex A3 has been built until then or it had been discontinued earlier with the introduction of the Autoreflex T3N.